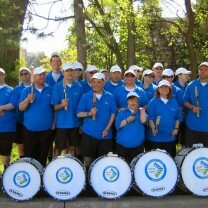 A small yet integral part of this is the Community Living Hamilton Drum Corps. 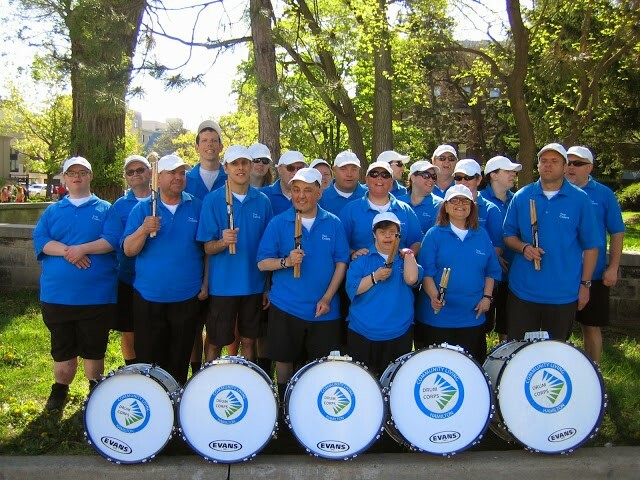 In 2003, with more than 16 years’ experience marching in championship Bands and Drum Corps, Vocational Instructor Robyn Garnier decided to inspire the organization and created the first All-Inclusive Drum Corps. Living the organization’s vision statement that “All persons live with dignity as citizens of their community, share in every element of living and have equal opportunity to participate”, the Drum Corps allowed us to inclusively showcase our abilities in music and marching. Unique to us, there is no paid staff. The Corps practices 2 hours weekly and is comprised of the organization’s members and community based volunteers. The Corps is 50 members strong, and consists of colour guard and percussion. Currently we have a repertoire of 16 original beats and song renditions. The philosophy of the Corps is: Inclusion, Life Experience and Fun. Many of our members have an intellectual disability; as well as a physical disability. The Corps members range in age from 17 – 70. The Corps members have changed not only their lives, but also the way society views them. Our members have gained self-confidence, and are the epitome of inclusion. They have become educators and entertainers. Always striving to gain new experiences, the Corp’s Drumline is excited to once again participate in DrumLine Battle. As ambassadors for inclusion, The Corps is frequently in demand. Over the past 12 years we have made many appearances, and received numerous accolades throughout Southern Ontario. We are proud to be the 1st of its kind and the only Community Living organization that has a Drum Corps.